Stephanie Deutsch's mother hailed from Long Island where she grew up eating oyster stuffing. Her father was from Texas and loved this cornbread stuffing, which the family continues to make. 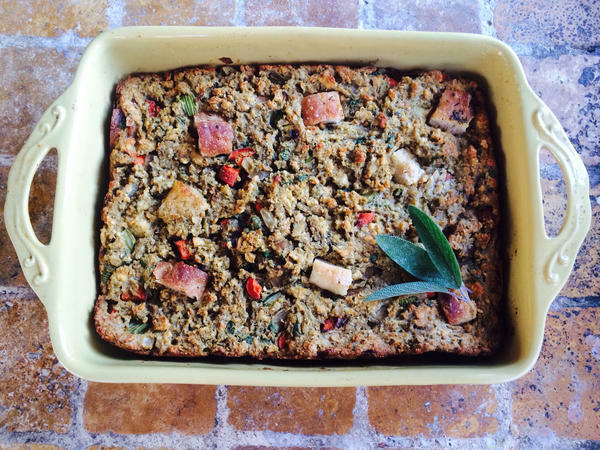 Anna Bertucci's Not Your Baba's (Vegetarian) Stuffing. "While I create experimental, upscale meals regularly," says Daniel Traster, a culinary consultant in Washington, D.C., "I treat holidays as a chance to revert to the traditions." So his stuffing is the version from his childhood — bread, onion, celery, herbs and stock. 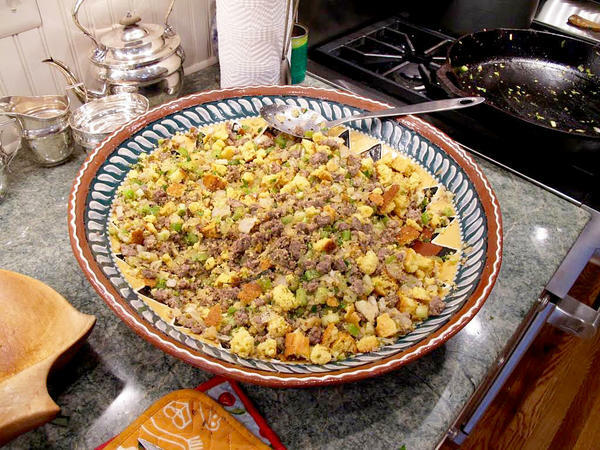 Stuffing, in particular, is the dish through which many families express long-held traditions. Even Adam Rapoport, editor in chief of Bon Appetit, makes a version passed down to him from his mother, who got it from her mother: a mixture of store-bought stuffing, Jimmy Dean sausage, homemade stock and a few herbs. Nobody fools around with family stuffing. NPR asked its community on Facebook for stuffing stories, and it obliged with tales of triumph and failure, joy and sadness and lots of opinions. The conversation starts with widely divergent positions on whether white bread or cornbread, rice or potatoes, chestnuts or oysters make the best stuffing. Conclusion: The best stuffing is very often the one you grew up with. Possibly the most virulent back-and-forth is over nomenclature: Is it "stuffing" or is it "dressing"? Some claim it's stuffing if it goes in the bird and dressing if it's cooked in a separate pan in the oven. There also are regional claims: dressing below the Mason-Dixon Line, stuffing in the North. Some Midwesterners call it dressing, too, although not Tim Swenson of Minneapolis, who writes on Facebook: "Dressing is for salad. Stuffing is for Thanksgiving." To further muddy the stock, in parts of Pennsylvania they serve "filling" on Thanksgiving made of mashed potatoes and sometimes rye bread. What goes in the stuffing/dressing/filling often depends on where you grew up or where your ancestors are from. New Englanders might add oysters, while Californians add persimmons, and Minnesotans go for the wild rice. Louisiana, always on its own culinary plane, offers rice stuffings with andouille sausage and shellfish. Ali Dunningham's family recipe has Scottish origins and is made with oatmeal and sauteed onions. Cyn Brunelle, like other Facebook posters, is of French-Canadian stock and makes a stuffing of mashed potatoes, ground beef, pork, onions and seasonings. Then there are the mixed marriages — Long Island oyster stuffing marries Texas cornbread stuffing. In Stephanie Deutsch's case, the cornbread became the standard. Sometimes there's compromise. Amy LaSalle writes that she grew up in the Northeast with bread and sausage stuffing full of sage and sometimes chestnuts. To accommodate her Texas cornbread-dressing-loving husband, she uses cornbread but adds sausage. Some Southerners make cornbread and biscuit dressing that hearkens to a time when leftover cornbread and biscuits were saved for stuffing. Northerners hold their own here, tossing leftover bread into the freezer all year, then mixing it together for Thanksgiving. Stovetop stuffing is the "traditional" recipe of many who wrote to NPR. "Stovetop stuffing, always and forever," Sara Faust writes. "You can pry the red box from my cold, dead hands." The commercial stuffing mixes that came on the market after World War II may partially explain the popularity of traditional bread stuffing. Add an onion and some celery, and you've got stuffing. But most people add more: giblets, bacon, cream of celery soup, apples, olives, maple syrup, rum, artichokes and "loads of butter" were a few of the ingredients from Facebook followers. Sage is the fresh herb of choice, while Bell's poultry seasoning gets a big shout out. Whatever goes in the stuffing, the most important ingredient seems to be tradition. "My grandmother taught me how to make her dressing. ... I've made it every year since she died, and now I am teaching my young children how to make it," writes Krista Monin Rumage. "It's nice to have her recipe there with us every year." Says Lake, "I found this recipe some 20 plus years ago in Bon Appetit magazine, and it has been our turkey of choice ever since. It is incredible. You will never do anything else once you have tried this." Heat oil in heavy five-quart saucepan over medium heat. Add andouille sausage and stir until crisp, about 10 minutes. Then transfer to a bowl using a slotted spoon. Add bell peppers, onion, celery, garlic, thyme, bay leaves, pepper, white pepper, file and cayenne to saucepan. Cover and cook over low heat until vegetables are tender, stirring occasionally, about 15 minutes. Mix in stock, tomatoes and salt. Increase heat and bring to boil. Stir in rice. Reduce heat to low. Cover and cook until rice has absorbed all liquid, about 22 minutes. Transfer to bowl. Mix in andouille and green onions. Stir crab into stuffing. Let cool. "This is my son's favorite part of Thanksgiving. I am allowed to make other stuffings in addition to but not in place of this stuffing. He is very firm on that. I usually double or triple the recipe so he has enough for days of leftovers. He often eats it cold, out of the container in the refrigerator." Place the rice in a colander and wash well under cold running water. Drain well. In a large saucepan, cook the onions in 1/2 cup butter, stirring until softened. Add the parsley and rice. Continue stirring and cooking for about 5 minutes, then add the broth and season with salt and pepper. Bring to a boil, cover and simmer until the rice is tender, 30 to 40 minutes. Heat remaining butter in a large skillet. Add the celery and leaves and sliced mushrooms. Cook until soft. Combine the cooked wild rice, celery and mushroom mixture, thyme and almonds. Season to taste. Stuff inside the bird and/or place in a buttered casserole and bake, covered, at 350 F for 35 to 40 minutes. If using the casserole, remove the cover, baste with turkey juices and bake another 15 minutes. Says Bertucci, "From what my mom tells me, my Baba, my Czech great-grandmother, used to make stuffing with a dozen eggs. But she raised chickens and ducks both in her country summer home and in her backyard in Chicago. She also killed them with her bare hands, so I'm suspecting her stuffing recipe had lots of gizzards and meat bits in there, too. My husband and I are vegetarians so we eschew the meat ingredients. Since it is really our main course on Thanksgiving, we think stuffing should have something to sink one's teeth into. We have found mushrooms work well. I do like to aim for the density of Baba's stuffing, only I use 3 to 4 eggs, not 12." Don't rush this! It works best if you can make this with someone else, preferably someone you love or someone you want to spend time with. Drink some wine together. Talk about sentimental things. Play some good music, like Doc Watson or the Pogues. It helps if one person can be on herbs. The cleaning, trimming, and chopping of them can be tedious. But that is such an important component, so don't get lazy and add too may stems in there! The other person can saute the onion and celery in some oil in a large pot. Cook until translucent. Add carrots and try to get them softened a bit. Add mushrooms and cook until browned and reduced down. Add garlic but turn off heat after about 30 seconds or so. Add salt and pepper. In a large mixing bowl, add your bread cubes. Slowly and in stages add some of your hot broth and alternately the wine. Use your bare hands to mix it. You want the cubes to maintain some of their geometric structure. So only add as much as you need to moisten the cubes and make them pliable. Mix in the cooked veg and the herbs. Add the beaten eggs and mix thoroughly. Spread mixture in a rectangular casserole or baking dish (I like mine thick, so I try to use one that's deeper). Spread remaining olive oil (or butter) on top. Bake at 350 with some foil covering for about 30 minutes. After 30 minutes, remove the foil and bake until browned but not too dark (another 20 to 30 minutes). We like it with or without gravy. It's almost Thanksgiving, which for most people in America means turkey and stuffing and family - but most importantly, stuffing. And we asked you what kind of stuffing do you make at home. We got a lot of answers and a lot of recipes. But one thing was clear. Some of you are very, very attached to your stuffing recipes, like Amy Meredith of Rochester, N.Y., who said she grew up with a simple bread stuffing, her mother's recipe. And then one year, she went to her boyfriend's house for Thanksgiving, where they served something a little different. AMY MEREDITH: As soon as I took my first bite, I realized my mistake because I got a mouthful of what can only be described as fishy, slimy gob of grossness. MARTIN: It was oyster stuffing, and she was not used to it. And she actually cried. MEREDITH: That stuffing represented for me everything that felt wrong. I was so homesick. And it was the wrong food and the wrong family. And I just cried. MARTIN: Everything worked out for Amy. She married that boyfriend, and now his family serves their stuffing with the oysters on the side. But why was her reaction to their stuffing so strong? We turned to WEEKEND EDITION food commentator Bonny Wolf for answers. She joins us in studio. Hey, Bonny. BONNY WOLF, BYLINE: Hi, Rachel. MARTIN: What is it about stuffing, Bonny? Why is it so sacred? WOLF: Well, I think Thanksgiving is the most evocative holiday for eating. And you could have turkey other times of the year. You could have possibly even cranberries. But stuffing really is connected to Thanksgiving. And so many things go into it. And there's so many things that tie it to where you grew up, what the traditions are in your home, that I think people are just really, really attached to their stuffing. MARTIN: Let's step back for a second because we also noticed a lot of strong opinions about what stuffing should even be called, right? There's a debate about this. WOLF: Yeah (laughter). This - a lot of people wrote in and said, stuffing is for Thanksgiving; dressing is for your salad. Other people said, dressing is for Thanksgiving; stuffing is for a teddy bear. So we had a lot of this. And it's also a regional difference. The people north of the Mason-Dixon Line say stuffing in general. People south of the Mason-Dixon Line say dressing, except for a few people in the Midwest who also call it dressing. And then there are people in central Pennsylvania who call it filling. It's mostly Pennsylvanian Dutch, Amish. And it's often made with mashed potatoes and rye bread. MARTIN: I don't know if we've cleared this up at all. But thanks, thanks for that, Bonny. MARTIN: Another thing we noticed interesting, stuffing doesn't have to be from a homemade recipe to create emotional resonance with a person, right? WOLF: Oh, absolutely. A lot of people wrote in about Stove Top Stuffing. There was one woman who wrote in and said, Stove Top Stuffing always and forever. You can pry the red box from my cold, dead hands. MARTIN: (Laughter). Hey, whatever floats your boat. Whatever tastes good, right? Are there any other trends in stuffing recipes we should talk about, Bonny? WOLF: Well, I think trends and stuffing are words that don't belong in the same sentence because people are so stuck on the stuffing they're familiar with. My son wants the stuffing that he grew up with, which is a wild rice stuffing. And I'd like to try something else, which he says is fine as long as we also have the wild rice stuffing. MARTIN: So you can change it up, but you still have to produce the tried and true stuff for your family that your son expects. MARTIN: Bonny Wolf is a Washington, D.C.-based food writer. She's been talking with us about stuffing, dressing. Call it what you like; it's delicious. Thanks so much, Bonny. Happy Thanksgiving. WOLF: And to you too, Rachel. Transcript provided by NPR, Copyright NPR.